The Fondillón is the NOBLE WINE of Alicante, defined as one who has achieved its high alcohol content naturally, besides being one of the most important historical wines of Europe. It must be made only with 100% Monastrell grape of Alicante. That high natural alcohol is achieved by the ripening of the grapes on the vine itself that fosters both the highest level of aromas and flavors of the Monastrell grape, that are nuanced during the fermentation and aging process by the "solera" system, to become in this unique winemaking jewel. The R.A.E dictionary definition of fondillon: "Seat and mother of the barrel when, after mediated, is refilled" refers to the system of "solera scale" traditionally used for aging. Through this system when the bottling is made, a part of each barrel is drawn off to the next, filling the decline with old wine from the best selection of Monastrell grape, Alicante principal variety. The production and aging is carried out with all the care and attention that a noble wine requires. One of our most important prides is to have preserved and sold continuously for over a hundred years, very old "soleras" of FONDILLON, the oldest began in 1892 and it is called " Gran Fondillón El Abuelo", honoring the founder of the winery and still in production. The Fondillón was born in the former orchard of Alicante city and later spread to the neighboring area of Vinalopó where it is currently producing. 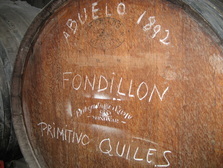 It was one of the most prestigious wines in the world until the phylloxera crisis and industrialization led to the disappearance of a large number of wineries producing in Alicante, and therefore the production was severely depleted, being the solera "El Abuelo" started in 1892 the only one who kept the flame of Fondillón until it went on sale the solera 1948, consisting of several barrels and with which it could have again a significant production and with continuity in the market.